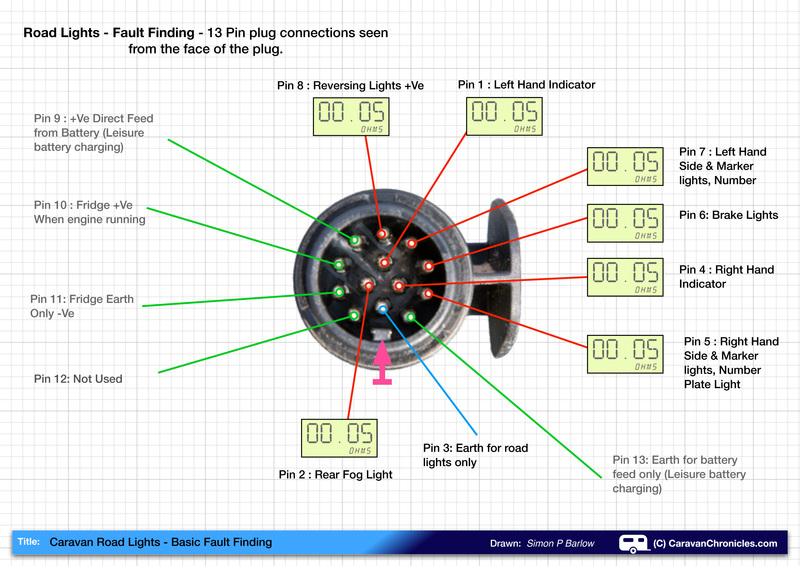 Here is a quick guide to basic fault finding on your caravan or trailer road lights. I’ll assume you have a digital multimeter and are able to use it to take voltage readings and measure resistance. If you are unsure how to use your multimeter, have a quick read through the instructions supplied with your multimeter. In many caravans, there is a fuse box located inside the caravan where the cable comes from the 13 Pin plug. These are usually the same type of “blade” fuse found in your car. Check these first and replace any ‘blown’ ones. 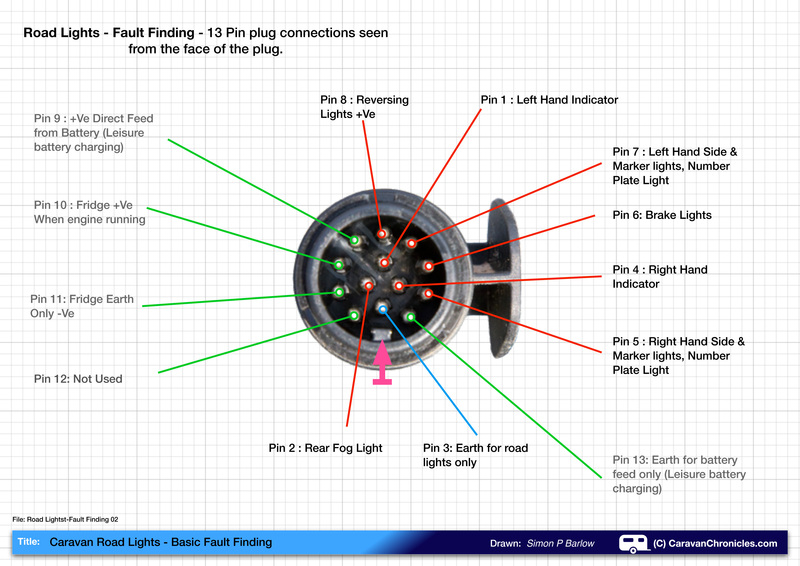 This may seem daunting at first, but taken a step at a time, it’s quite easy to test the road light circuits. I’ll assume you have connected up your caravan (or trailer) and found one or more of the road lights, indicators, side lights or brake lights that are not working, and you have checked the fuses, if any. By following this guide, it will take you through all the steps required to undertake a basic fault-finding process. Before we jump in, there might be something we can work out to help us. As we are going to be using the multimeter set on “Resistance” on the lowest scale. Your multimeter might have the symbol “Ω” – the Greek letter Omega used to indicate “Ohms” or resistance. The settings might be 20, 2K, 20K, 200K, 2M. You want to use the lowest, in this case 20. It would be helpful if we had an idea of what resistance reading we should expect for each circuit. Well with some simple maths we might be able to get a good indication. But…. we have a big problem here! If you measure the resistance of your 21 Watt lightbulb using your multimeter, it will probably read 0.2 or 0.3 Ohms. So what’s going on? The metal in the filament has a ‘positive thermal resistance coefficient’. That simply means when its cold, the resistance is lower and as filament of the bulb warms up and starts to glow. the resistance increases. What seemed like a good idea on paper isn’t so good after all ……. or is it? If we have a reading below 0.8 Ohms, we can assume the circuit is OK, but we should never get exactly 00.00 Ohms, there should always be ‘some’ resistance. If the reading is exactly 0 Ohms then it is likely a ‘dead short’ in the circuit, but more of this later. The first step is an easy one. Test the bulb! If it is just one light that doesn’t work, it is a simple task to remove the light unit lens and check the bulb. For guidance on removing any of the bulbs on your caravan, have a look through the owners handbook as there is usually a section on changing bulbs. Most handbooks also have a chart of what the correct wattage each bulb should be as well. The easiest way to do the following tests is on the 13 pin plug itself. To do this without disassembling the plug there are a couple of ‘tricks’ we can use to make it easier. The first trick is to secure the plug in a location that reduces the requirement to have three hands! I like to use a large spring clamp….. If we make sure the plastic location ‘key’ inside the plug is at our 6 o’clock position, it makes identifying the pins so much easier…. In the photo’s I am testing the road lights on my trailer, so clamped the plug to the hitch handle. On your caravan a good place is to clip it to the hand brake and use the ‘A’ frame fairing to rest your multimeter on. In this instance, it was easier to place it on the ground….. The second trick overcomes the need to be able to hold the points of the multimeter test leads on the end of the pins with the skill of a surgeon. I use a couple of the straight through crimp connectors…… I find the blue size the best. Simply push them on to the ends of your multimeter test leads and they provide an easy way to hold the test lead probes on the 13 pin plug’s individual pins. Using the crimp connectors makes the task so much easier, the test leads don’t slip off the pins. We are now ready to start testing, lets look at the pin connections seen from the face of the plug. Note the orientation of the plug, especially the ‘key’ at the 6 o’clock position. TOP TIP: Remember, if you want to see any of the drawings or pictures full size, you can simply click on them, or you can down load them as PDF’s from the links at the bottom of the page. Please remember, they are for personal use only. Even if you know which circuit isn’t working, it’s always best to work in a logical order. Start with pin 1 – Left hand indicator. This is the positive (+ve) cable to the lightbulb, so we also need to connect to the negative (-ve) or “earth” for that circuit. All the “earths” for the road lights are connected to Pin 3. 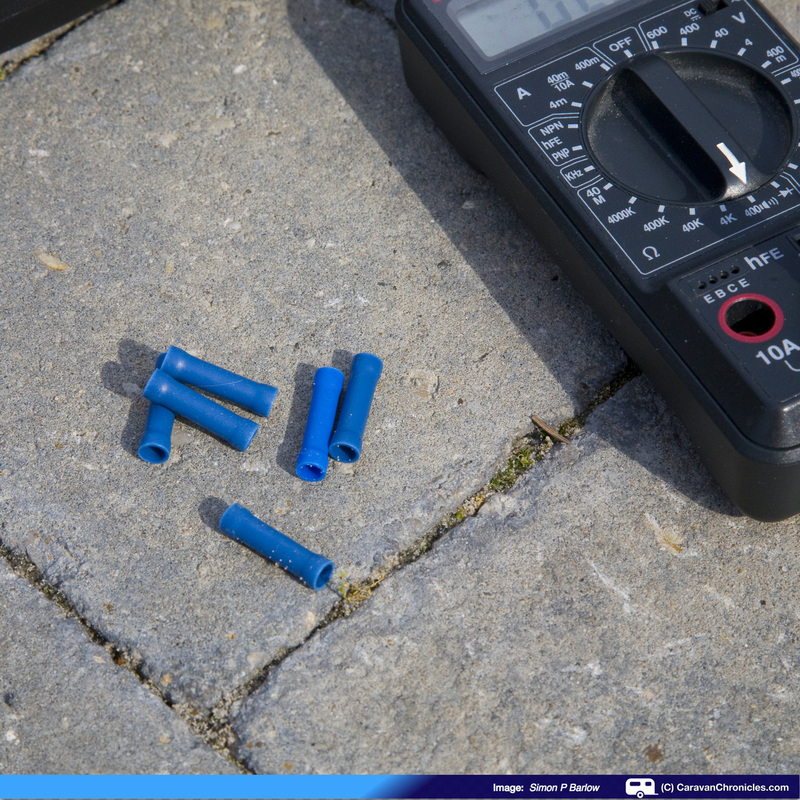 Set your multimeter to the lowest ‘resistance’ range and touch the tips of the test leads together. You should have a reading of 00.00. Place a crimp sleeve on each test lead and put the Negative (black) lead of the multimeter on Pin 3 and the Positive (red) test lead on Pin 1. You should get a reading between 00.01 and 00.06 Ohms. Continue to check each pin and note the readings….. If all goes well, you should have a similar reading for all the road light circuits. However, if all the circuits show a ‘high resistance’ of 05.00 Ohms or more, then it is probably a bad earth connection in the plug and you will need to open the plug and check for a bad connection. If the ‘high resistance’ reading is for only one set of lights – left indicator and left side lights, it is more likely that the earth connection in the light cluster is the cause. 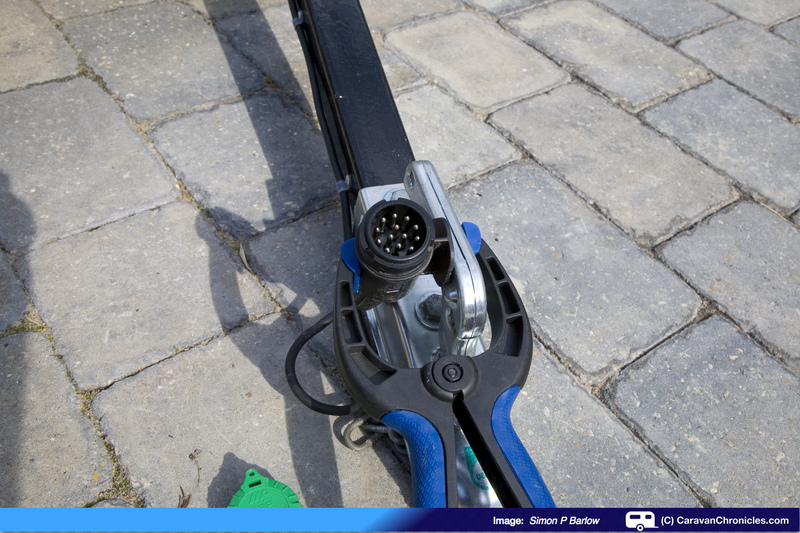 The most common problems with the electrical connections between the car and caravan is the earth connection. A faulty earth connection can lead to strange things happening… for example, when you put your indicators on your brake lights flash instead. 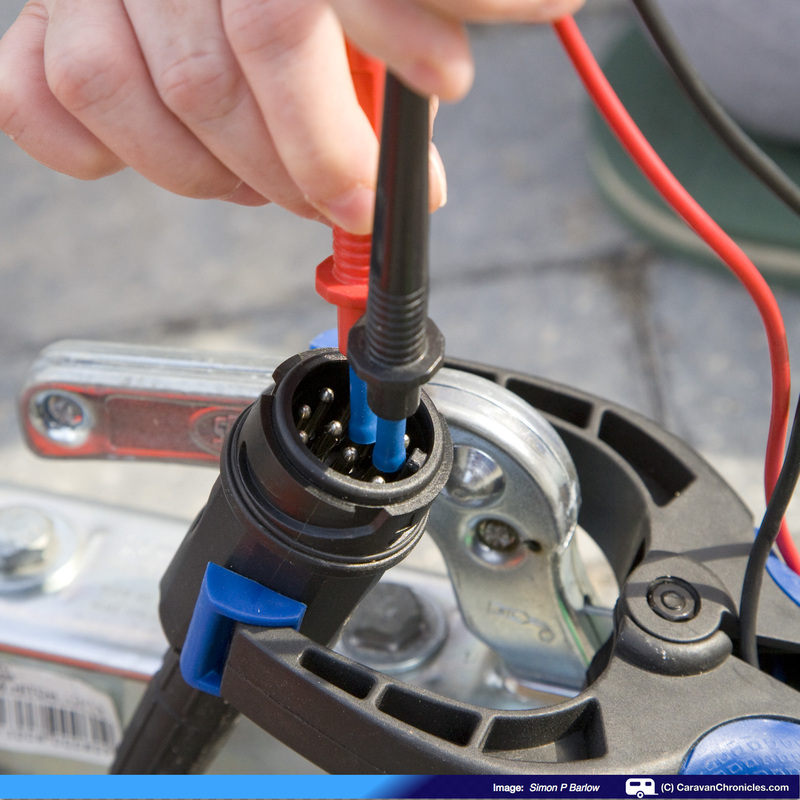 If you have read 13 Pin Socket – Basic Fault Finding or Understanding the Leisure Battery Charging Circuit you will know that the caravan’s 12 volt system has three Neutral’s or Earth’s – road light circuit, leisure battery charging circuit and fridge circuit and within the caravan these should all be separate… i.e. not electrically connected. Why are there three ‘Earth’s”? Each circuit has its own ‘return path’ (Earth) for safety. 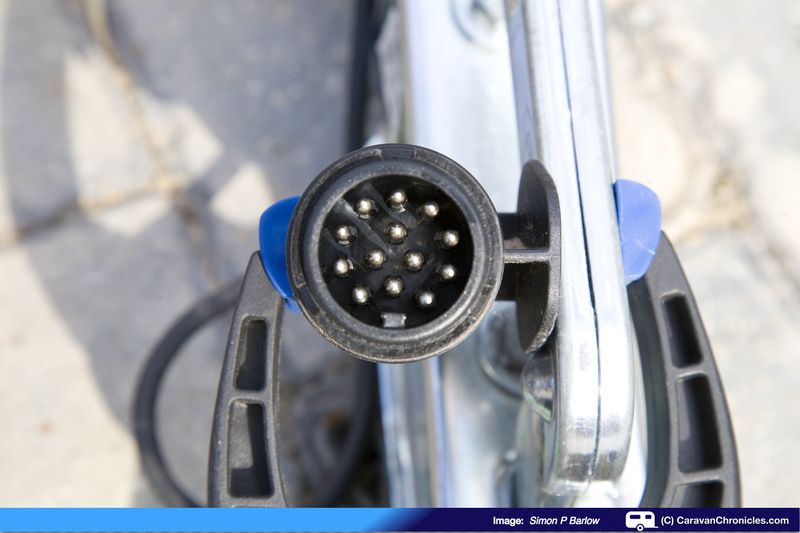 If any one of the earth’s should become disconnected in the plug (or socket on the vehicle) then the remaining pins would have to ‘share’ the load. So for example, if the fridge earth became disconnected, the earth path would be through one of the other circuits and could lead to excessive current through the remaining cables and plug pins. By keeping the earth’s separate within the caravan the chance of this occurring is zero. We can do a quick check to confirm the earth’s are indeed separate. It is three quick measurements between the three earth pins…. On your multimeter, when it is set to read ‘resistance’ as long as the test leads do not touch each other the display will probably read ‘OL” (Open Line) or “OC” (Open Circuit) whichever it is, this is what you want to see. In the example above, my multimeter reads “OL” which indicates there is no connection between any of the three earth return circuits. NOTE: Some smaller multimeters just show a ‘–” when set to the resistance range and the test leads are not touching each other. Please check the instructions that came with your instrument for details. If you do get a reading showing a connection between any of the earth circuits, you must stop and investigate this further before doing anything else. I have used your site and checked the feeds into the caravan, which are fine (I have no left hand side or tail lights on the caravan), I realise there is only the black lead on pin 7 of the 12N socket and am in the process of chasing the circuit through the caravan but the routing seems odd, I know this is a difficult question but is it normal for caravan road light wiring to go back to the middle of the caravan before it splits off from side to side? I am now back as far as the fridge and haven’t found anywhere that the circuit splits off to the left side as the main harness runs down the right site of the caravan. Any advice you could offer would be much appreciated. The caravan in question is a Swift Classic Coronette and the fault started as an intermittent fault which is now permanent, when it first happened the lights came on within a couple of minutes when the caravan went over a bump! The ‘usual’ method is to route the cable in an “L” configuration… down one side then across the back. This way only one earth cable is required to the first set of lights, then across to the second set. If it was a “Y” configuration the earth cable would require splitting at the junction and hence need more cable. This is also true for some of the other lights – reversing lights for example. If you look at the labour cost, its lower too as it takes less time to route an “L”. I would try and trace the wiring loom from the failed lights back to its junction with the main loom. I would tend to suspect that the failure point is the earth connection there. 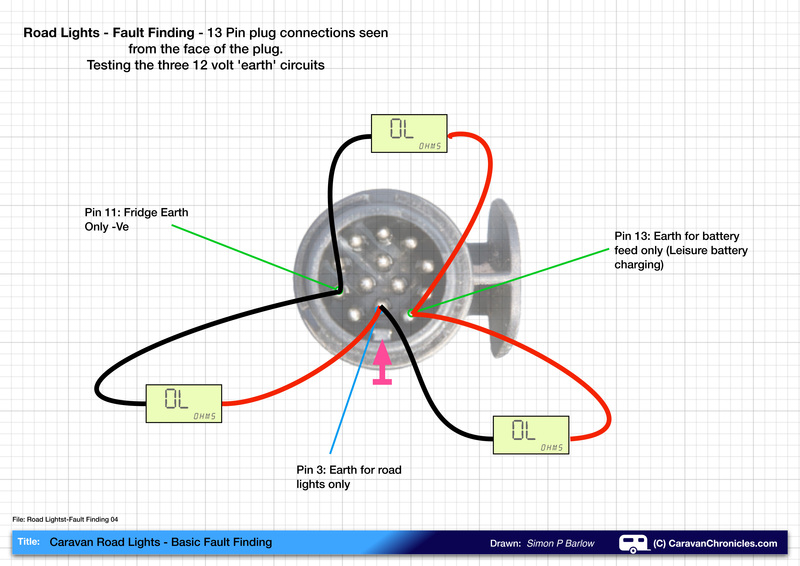 it might also be worth trying to see if the working lights have two earth connections… one going to the front 12N plug and the other going across tot he failed lights. sometimes manufacturers use the connection to the light cluster as a junction for the earth cables. Not good practice but quick and easy (cheap) for them. Thanks Simon, the problem is that the front and rear side lights on the left side of the caravan aren’t working so tracing back from the lights isn’t easy! I used an Ohm meter so I know there is a break somewhere in the positive circuit between the lights and the fuse board and am now in the process of chasing it back. If all the lights are not working on one side, check the earth link to the lights as that is usually the only link that is broken. If it’s only one or two not working, then it will be the positive feed to the lights. If its that, then have a think if anything could have been moved recently that could have trapped the loom and damaged the cables. Thanks Simon, I will get back onto it as soon as I can and follow your advice. Oops, just re read your original post, I read it as no rear side lights… thinking all the lights were off on one side (tail, stop, etc.) not as I think you intended rear and side lights (my bad!). OK, then it must be the +ve feed. Just a thought, have they split out just the front, side and tail lights from the front of the van to run down one side and the rest in a loom to the rear on the other? I have traced the harness from the input to the caravan from the towing vehicle to the fuse boards and am now following the main loom along the right hand side of the caravan but haven’t yet found where it splits off from one side to the other. As you have said that the “normal” configuration is an “L” shape I will go to the back of the caravan and check it out from there, but it doesn’t seem to make much sense to take the circuit along one side only to come back down the other just for the front side marker light, i would probably have split from the fuse board and taken one short cable run to the front side marker and run another circuit to the rear, but I have never wired a caravan so this is probably not the way it is done. I have a 2010 Honda CR-V with factory fitted loom. 2 socket system as been changed to 13 pin socket which has a micro switch. Have found the micro switch cables are not connected. There are 1 x red cable with black stripe. 2x grey cables (joined) and the same with 2 blue cables. Is there a diagram to show where these 3 connections go to the switch? Also all 12 main pins have shown to be o.k. But the car rear fog lights are not working whilst not connected to caravan. You will need to check which module is installed (there are around 4 different ones on the market) between the Honda vehicle electrics and the tow bar electrics to establish how the vehicle detects a trailer, some are done on the canbus by detecting if the trailer lights are present, some are done via a microswitch in the socket detecting the presence of a plug in either the 13 pin or 12N socket. There should have been a set of paperwork for the module given to you when the tow bar was installed, one will be the conformity certificate and the other should be the install/user guidelines. Either one should have details of which module was installed. Once you know which module, you should be able to find a wiring diagram on line which will tell you what each of the cables relates to. I’ll see if there’s any clues in my paperwork. Here’s a real puzzle. 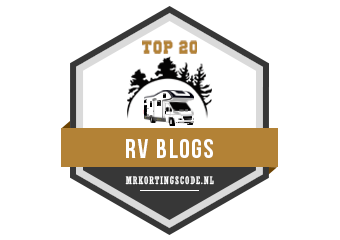 I tow my 2013 Sterling Eccles with a 2010 Ford Galaxy. The Galaxy is fitted with a Witter towbar with dedicated electrics that Ford had to “switch on”. Everything has always worked. I’ve just bought a 2013 Volvo XC70 and had a towbar fitted by Volvo again with dedicated electrics. When I plug the caravan into the XC70 a “indicator bulb failure on trailer” message appears on the XC70 dash, the caravan indicators don’t work nor do the caravan reversing lights. Everything else does work (brake, fog and side lights, constant live, fridge, battery etc). I know someone with a 2010 Bailey so I plugged the XC70 into that and everything works including indicators and reversing lights. I plug the Galaxy into the Sterling and everything works. So there’s some sort of incompatibility between the XC70 and the Sterling. Anyone got any ideas? I’ve fixed the problem and am posting this in case anyone else experiences the same problem. The only LED light on the van is the high level brake – everything else is tungsten. One day I was fiddling and the caravan offside side lights went off. When I twisted the 13 pin plug in the Volvo socket they came on. Loose connection? Indicators still not working. I bought a trailer light tester from Amazon. It was 7 pin with 13/7 pin adapters both ends. The tester said all circuits working correctly car and caravan. I then unplugged both 13/7 pin adapters from the tester and plugged them in together so 13>7>13. I plugged this and hey presto, indicators working. I couldn’t tow with this in place because there was no constant 12v for the ATC, but it proved the Volvo could power the indicators. So the fault had to be in the plug or socket. I dismantled the socket. The van is only 4 years old but the connectors were badly corroded. All electrical connections were tight. I slackened each one and re-tightened and plugged it in and everything worked. That’s all it was after all those weeks investigating. Just read your article and find it very helpful. I appreciate being in a minority but here is one area that does not seem to have been covered and that is the electrical connector/adaptor for vans purchased abroad but used with a UK vehicle. I bought a new one (12S) about a year ago for my 2005 Hobby as the original was getting worn and took considerable “working” to get lights to work properly, however the new one produced weird results when tried last week. Most road lights no longer work even though I have cleaned all contact areas in the clusters. Of the two that do, one produces poor light and the other comes on very brightly like a brake but it is an indicator bulb. I am wondering whether the continental colour system of the wiring the same as ours, been changed in adaptors recently or is mine faulty? The road lights are connected using 12N, not 12S (S is “Supplemental”) which is the leisure battery charging, fridge and reversing lights. From the details you have given though I would suspect a faulty earth. I have a rather puzzling one. On my caravan, my indicators work perfectly fine, but my brake lights are dim (and when braking my fog light also comes on dimly). Also, when I brake it cancels any indicator flashing on the caravan too. I’ve tested the 7 pin coming from the car (I just have single electrics) and everything works as it should. Scratching my head here but wondered if you had any thoughts? Sounds like an earth fault. 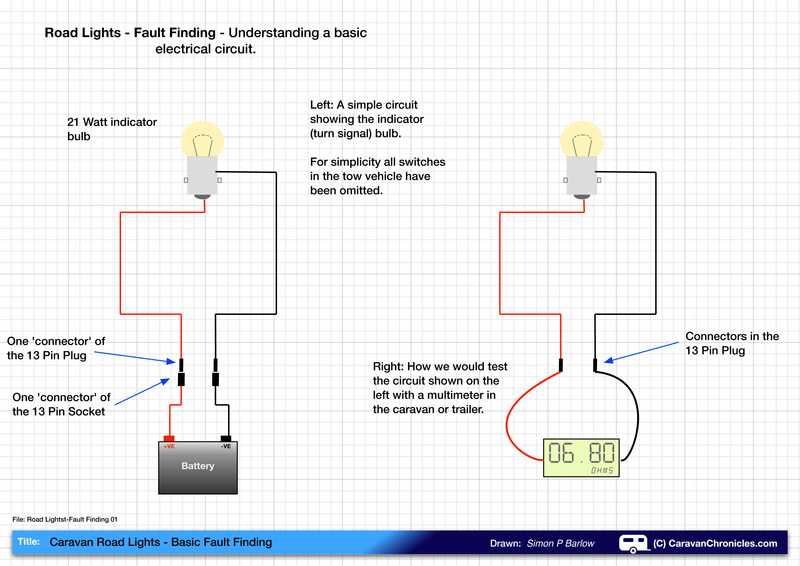 Indicators seem to work OK but they will be earthing back through something… like caravan brake lights back to the vehicle and then to earth via the vehicle brake lights. (think of following the path of the electricity.. it always wants to go home so will find a way to earth somewhere) When you break, that path is lost so the other alternative is the fog light. Start by just getting a long length of wire from an earth point on the vehicle to a light cluster and see if everything works OK, if it does, you know to trace the earth cables from the lights back to the vehicle. Assuming you mean the lights on the caravan…. Most likely the earth to that light cluster has become detached or disconnected. There is usually only one earth cable running from the front of the caravan to the rear for the rear road lights. This is to keep down cost and make it easy to install the wiring loom when the caravan is constructed. You should find an earth cable running across the back of the caravan from one light cluster to the other. If only one side of your caravan lights are not working, it is usually a fault with this cable. Dead Mr. Barlow. This is an excellent review. Issue at hand. Trailer disconnected from tow vehicle, the plug stayed connected to vehicle but all of the trailer side wires pulled out from the plug. How do I figure out which of the 3 ground wires go back into the appropriate trailer side plug pins? If the trailer has only road lights, these are all earthed using pin 3 and it should be a white cable in the trailer lead. Simon, pursuant to my comment. This is a euro boat trailer with a 13p plug. Thank you. Hi simon I have recently changed my tow car from a Nissan X Trail to a Kia Sorento, since doing so my side lights on my caravan light up when the brake lights come on, the only difference I can see is my Sorento has LED rear lights, what do you think? I think you might have a dodgy earth for the road lights in the caravan. When you brake and the brake lights come on, it sounds like they are finding an earth return path through the side lights. 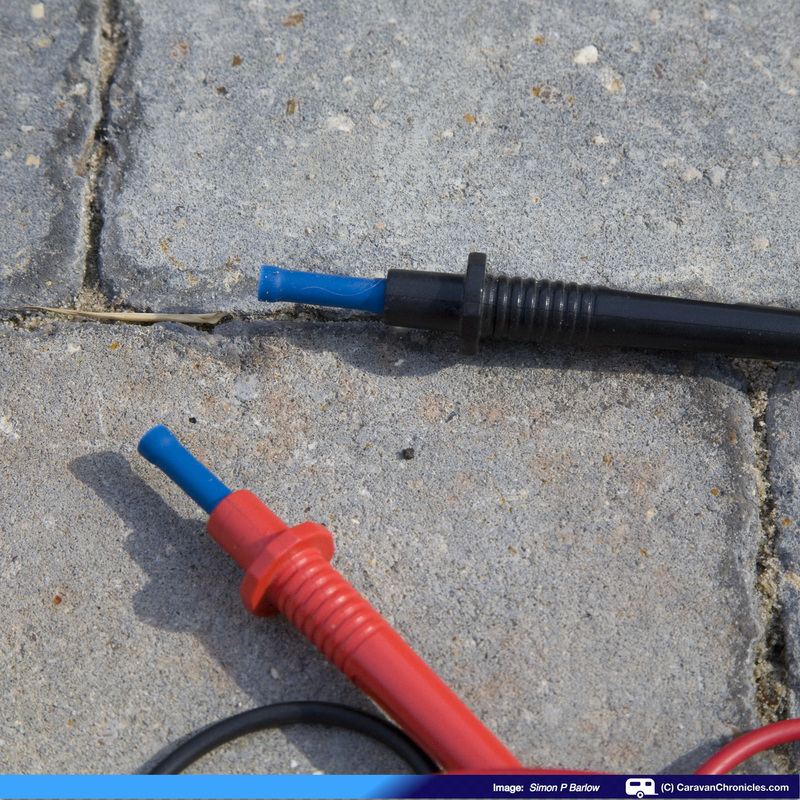 Try taking a length of wire from a good earth point on the vehicle to the earth point in the caravan where the cable from the plug enters the caravan (it is usually a small fuse box that services just the road lights) and see if that makes a difference. If it does… its either the earth connection in the caravan plug or where the tow socket is earthed in the vehicle. Hi have a problem that the lights on my 2009 luna clubman es caravans rear lights have stayed on when we have disconected it from the car. Its not the outer lights but the next ones in and they look like a circle of red leds. Be grateful for any suggestions. All switches sre off on the caravan. My triton is hooked up to my jayco journey outback. No lights are working. No brake lights, no tail lights, no white side lights on caravan. Help….. I would guess if no lights are working then it is a broken earth (ground) connection between the vehicle and trailer. You can easily check if you have a length of wire by making a temporary earth link between the vehicle and trailer and checking the lights. I tow a bailey pageant burgundy 2005 with a volvo v70 2005. Is there anything on the van side to cause the fog lights to not switch off…. or is it more likely to be a relay on the car side. Looks like after market wiring on tow loom not oem. There should be nothing on the van side that would cause the rear fog lights to operate (no relays etc.) That is of course unless there is a wiring short between the fog light circuit and another circuit. I would tend to look at the output of the towing socket to see if there is a voltage present on the fog light circuit. Have rattling around in the back of my mind there was an issue with the DRL lights causing the fog lights to come on with Volvos… but I think this pre-dates your 2005 Volvo by a number of years. From what you say it would initially appear that the ALKO ATC unit is powered from the OS road running light circuit. 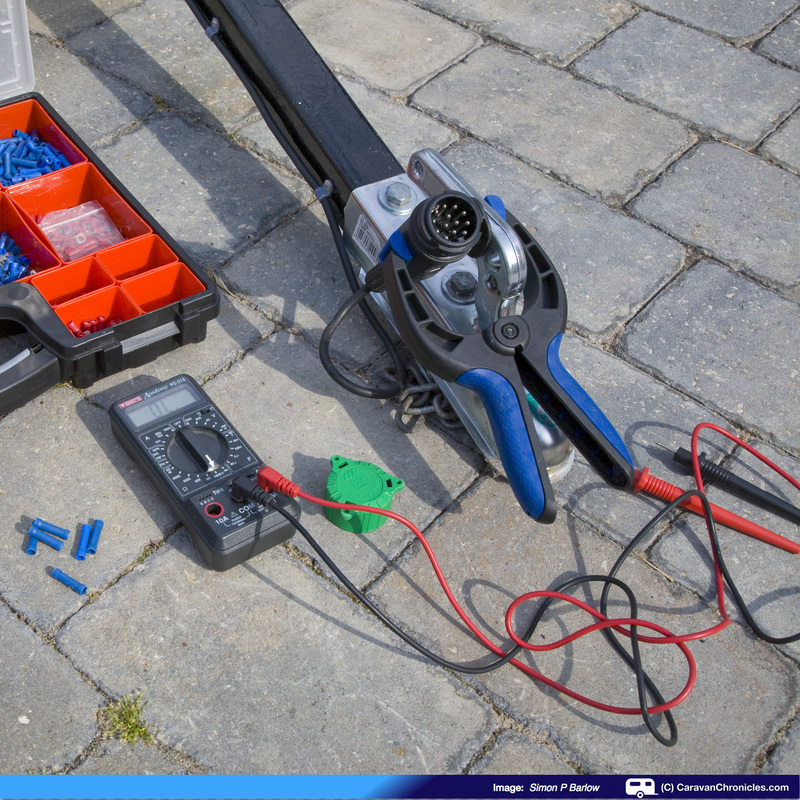 It should be powered from the leisure battery charging circuit so that as soon as the caravan is connected to the vehicle the ALKO ATC unit gets power and goes through its self test. Once the engine is running and the habitation relay has energised, the ATC unit can then draw power from the leisure battery charging circuit AND the leisure battery if required. If the ALKO ATC is a factory fit on a new caravan, I can’t imagine it was connected incorrectly when the caravan was built. If it was added by the dealer, again I can’t see that it would have been installed incorrectly. Although there is always that chance. Have you had any electrical work done on the caravan recently or changed your tow vehicle so that this issue now showed up where it might not have done on a previous vehicle? This does require further investigation as it is potentially compromising the effectiveness of your ALKO ATC system and may not work as intended. The ATC completes its test even if the 5 amp fuse is blown, though the lights don’t shine at all. With a 7.5 fuse the lights are on momentarily & seem to dim and then go out. Its a 2014 Swift Celebration and we purchased it new from Glossop Caravans. There hasn’t been any electrical mods., not sure if the ATC is factory fit or Glossop. It seems to have been generally ok but I did change the car to a new Nissan Navara truck a couple of years ago c/w towing electrics and adder for +ve supply though I thought it was functioning ok until more recently. I noticed that when the ATC was not working (I assumed a poor 13 pin connection) the lights were ok but occasionally when the ATC worked the lights went off.. So, I replaced the 13 pin connector expecting to solve the issue but now the ATC works consistently but clearly there is some sort of interaction issue. I’ll have to check out exactly what is going on. Check the earth connections. You should have an earth for the road lights pin3, leisure battery charging pin 13 and fridge pin 11. Check with the caravan unplugged from the vehicle that all three are separate – no connection between them. If this checks out ok, check to see if the ATC is earthed to the leisure battery earth. If this checks out ok, I’d guess that the leisure battery earth path from the vehicle 13 pin socket maybe suspect. I think what may be happening is it is finding an earth path through the vehicle road lights or road lights earth. Do the vehicle lights dim too? Wow…. wouldn’t have expected that…. what an epic bit of fault tracing! We have a Unicorn Series 3 which has rear LED road lights some of the LED’s have failed and the replacements are possible but about 4 times the cost compared to normal lamps. Do you know if the caravan cables are suitable if I were to remove the LED units and replace with normal lamps ? My concern is the additional current drawn by the lamps compared to the LED units. Sorry it’s taken a few hours to reply but I had to do a bit of digging around to be able to answer your question. As far as I can tell the wiring is 1.0 or 1.5mm2 so should be able to handle incandescent lightbulbs. If it is 1.0mm2 there will be a voltage drop which will reduce the efficiency somewhat. Something you will need to take into consideration is the heat generated by normal lightbulbs is greater, therefore you will need to make sure that the light fittings are OK for the additional heat. Not too much of a problem with reversing lights and indicators but might be an issue with combined tail/stop lights especially at night. I’m not familiar with the light fittings on your specific caravan but it might be worth searching on the internet to see if any 3rd party manufacture sells replacement units. The other thing that has to be considered is the fact that the light fittings as manufactured will have met the current regulations, changing over to conventional bulbs might invalidate this as the output light pattern will not be the same. Thanks for the detailed reply, these days Bailey on later models fit a bulb type unit they seemed to have gone off LED’s. Bailey sell a replacement LED unit at about £55 and a normal bulb type at about £12. Just taken a look at the user manual and it states 1.5mm2 cable size therefore should be OK.
Had strange problem today which doesn’t appear to be covered by any of your (very helpful) articles…..
No matter which indicator I select, both left and right lamps on the caravan illuminate. The car indicators work normally (when hitched) and all the other caravan lights work fine. So far I have tried to isolate the problem …..
An experiment with a test meter at the plug shows zero resistance between pins 1 and 4. Opening the plug confirms all connections are good with no loose or stray wires. Cutting into the yellow and green wires below the rear of the van (just before they disappear up behind the back panel ) give zero resistance between the wires to the lamp units. Does this point towards some sort of short behind the back panel, or could it be another manifestation of an earth fault? Zero resistance between 1 and 4 on the plug really means that somewhere 1 and 4 are shorted together. Check between 1 and 3 (road light earth) that should have a small resistance. I’d remove both of the bulbs and check to see if there was still zero between 1 and 4. If there is, it’s a short in the cabling. I’d hazard a guess here and start looking at where the loom split to go to the left and right clusters for some sort of damage around a cable clip with the loom bouncing about and wearing through. Another place to look is where the service cable enters the caravan. Usually just inside there is a junction box to transition from the multicore plug in cable to the caravans internal wiring loom, it may be in the form of a small circuit board with fuses for the road lights. Sometimes these are not optimally positioned and something can fall into them causing unusual shorts. I’ve come across a parker pen, bulldog clip and coins before now. Pot back and let me know how you get on. Thanks for the ideas of things to check. Unfortunately the van is kept in a storage compound some distance away so it’ll be the weekend before I can get to try them out. I will let you know the results next week. Well, I have now got the lights working without actually nailing down the problem. After trying out all the suggestions above I finally decided the short had to be somewhere behind the back panel. Cutting the yellow and green just before they disappeared upwards…. I simply ran a new wire to each light unit – disguising them as best I could. End result is that the indicators now work as normal ….. hooray! Obviously there is some sort of issue behind the back panel which I hope doesn’t effect the rest of the cabling …. perhaps it’s time for a van upgrade. Sounds like it may be a bit of fretting somewhere in the wiring loom then. It always annoys me that the wiring for the tail lights is damn near impossible to access on a lot of caravans… I’m sure it could be constructed in a manner that would allow some form of access for fault finding or replacement. Glad you managed to sort it out though.